Asics Gel Venture 5 Review - To Buy or Not in Apr 2019? A pair of high-quality shoes can be a good way to express one’s personal taste and their sense of comfort. Nevertheless, runners need to take a number of things into consideration before purchasing the most comfortable, high-performance, and long-lasting running shoe possible. The Asics Gel Venture 5 ensures high performance and durability by featuring a plush cushioning underfoot mechanism, an upper unit securing the foot from shocks when moving speedily on the trails, and a trail-specific outsole all in one. This shoe provides a more soothing running experience compared to the Asics Gel Venture 4 and other versions, especially during outdoor adventures. The upper unit is novel to the Asics Gel Venture 5, making use of long-lasting materials that help the foot stay protected when traversing the tracts. This unique material does not fade away or wear off easily, maintaining its integrity even after heavy use. The Venture 5 has a great in-shoe feel thanks to its soft, breathable inner lining. An industry-standard EVA foam is used as the midsole unit and it y provides responsiveness, durability, and adequate comfort during a run, with a marked improvement in overall responsiveness. All these improvements and more make the Venture 5 the best of its line so far. The outsole of the Venture 5 is optimized to trail running and is outfitted with tenacious multi-directional lugs that grip the ground, providing traction and control during uphill climbs and descents. Made of AHAR (Asics High Abrasion Resistant Rubber) that are wear-resistant and long-lasting, the outsole protects the runner from hazards found on the trail. The horizontal and vertical flex grooves cut into the outsole provide flexibility and smooth strides that allow for the foot to move naturally and help with the overall efficiency of the run. The midsole of the Venture 5 is industry standard EVA, which is a lightweight and responsive cushioning system. Comfortable and shock-absorbent, EVA is a durable material that retains its cushioning ability long into a shoe’s life. The unique element of the Gel Venture 5 is the Gel® Cushioning System that is placed in the rear foot of the shoe. This aids in absorbing the shock of impact during heel strikes and provides additional overall cushioning, which heel strikers will appreciate. The upper of the Gel Venture 5 is made from a breathable mesh material that provides excellent ventilation. It is also tightly woven so its integrity is maintained even after heavy wear. Stitched synthetic overlays provide overall structural support while also protecting the foot from hazards that can be found on the trail and in nature. The sock liner is smooth to the touch and helps reduce potential irritation. A toe and heel cap shields these vulnerable sections of the foot from damage while a pull tab on the back helps aid in taking off and putting on the Venture 5. The Venture 5 is a surprisingly lightweight trail shoe, with men’s coming in at 10.7 ounces/303 grams and women’s at 8.7/247 grams. Although breaking the 10-ounce mark would usually signal to runners that this isn’t a lightweight shoe, for trail shoes—which are usually significantly heavier than most running shoes—in this case, it is. The Venture 5’s durable mesh upper feels good against the skin and fits snugly after lace-up. The mesh keeps the foot well-ventilated during a long run, which is important since physical discomfort is sure to follow an overheated foot. While most running shoes are very breathable, what is significant is that is the Venture 5 is a trail running shoe. For a trail running shoe to have great breathability is something to note while comparing potential purchases. The breathability of the Venture 5 also prevents feet from collecting odd smells, which is usually common in trail running shoes that excel in being super durable and waterproof. And although breathability is a great thing, it’s worth considering the potential downside to hitting the trails in a pair of these, as they are not waterproof. However, if a runner requires their foot to keep cool during a trail run, the Venture 5 receives high marks in this instance. 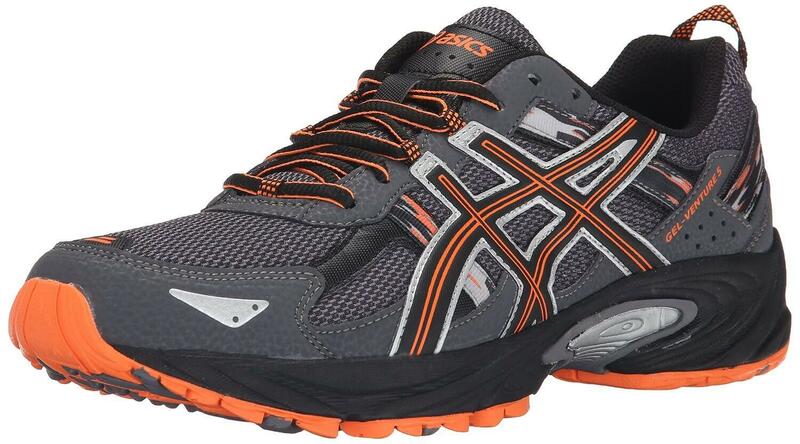 Asics have a reputation for making comfortable shoes, and the Gel Venture 5 follows suit. The cushioning employed in this trail shoe provides comfort and also prevents the runner from feeling any discomfort or developing potential physical damage from their motion while wearing this shoe. Its EVA modeled midsole helps control the foot’s balance and absorbs rough shocks. This cushioning is also very lightweight, which is what has made EVA foam such an industry standard and can be found in popular lightweight running shoes, such as the Nike Air Zoom Pegasus. Some shoes in the Gel Venture series have an amazing correlation between style and quality. The color schemes and design of this shoe translate to a stylish trail runner, which is often rare because trail running shoes tend to favor utility over fashion As stated earlier, a shoe represents the taste of the person who wears it. Ask yourself, what are you looking for? In the case of the Venture 5, the answer could be: a shoe made to tackle the trail but with a bit of style attached. It is a curious question regarding how long a pair of Asics Gel Venture 5 will last after arranging so much protection for its user. The answer is quite positive regarding its durability. The high abrasion rubber that have been placed in some critical areas make the outsole of the shoe exceptionally durable. Although it is still too soon to announce the average durability, as they have just arrived at the market, positive feedback from runners who have worn previous editions of this line indicate that the Venture 5 will be quite durable. The high-quality outsole strongly resists against wear and tear, even after heavy use, while the sturdy mesh and stitched overlays protect the upper from deterioration. The responsiveness of the Asics Gel Venture 5 has been commonly hailed by reviewers, indicating that the responsiveness is higher than in other comparable trail running shoes. Feet need extra support during a run, and the Asics Gel Venture 5 provides that, rescuing the wearer from unexpected physical troubles or pains that are common complaints from runners. Running shoes not only need to be durable, but trail running shoes also must safeguard the wearer under potentially tricky terrain and other circumstances. Keeping the extra speed and balance of body in mind, Asics gave additional care and effort while designing and producing the Venture 5 in terms of the support they provide. The multi-directional lugs on the outsole aid in navigating tricky terrain, while the EVA foam midsole and GEL cushioning in the midsole provide additional cushioning and responsive support. As a result, trail runners can go mile after mile without worrying about the Venture 5’s support letting them down. However, this shoe is designed specifically with neutral runners in mind, so runners that require a stability shoe or extra support may need additional supportive insoles. Like the Solomon Sonic Pro, the Asics Gel Venture has been designed to handle a number of terrains, such as the road, mountains, uneven and rocky areas, and so on. Since the outsole is outfitted with multi-directional lugs, which help navigate some tricky surfaces such as including sand, muddy paths, dirt, and rocky and hilly terrains. Although the Venture 5 can handle the most terrains, they are best suited to tackle almost all trails, including hilly and uneven ones. Trail running shoes have a lot packed into them, and for good reason: they must be depended on in a clutch moment, where one slip or stumble could lead to potentially serious injury. As such, they are loaded with aggressive lugs and outfitted with protective elements many running shoes simply would not have. This also leads to very expensive shoes. But trail runners rejoice: the Venture 5 comes in at a surprisingly low price point! In fact, shockingly low, if one bargain hunts online. In fact, this is one of the most affordable trail-running shoes on the market. Heck, you may just want to buy a pair to have on-hand, trail runner or not, in case the mood strikes you one fine Spring day and a nature walk seems in order. The outsole of the Venture 5 is made to take on the trail, and how could it not? The three elements that comprise its outsole provide excellent traction on the tricky terrain that nature tends to throw at the trail runner. Made of High Abrasion Resistant Rubber, the outsole is outfitted with multi-directional lugs that provide tenacious traction, gripping the earth and making quick work of climbing that hill and finding one’s way back down. Besides this, the multiple vertical and horizontal flex grooves cut through the outsole provide a great amount of flexibility and help with natural foot roll during a run, allowing the runner to navigate potentially treacherous terrain while retaining a natural feel. Simply put, the traction the Venture 5 provides is a force to be reckoned with. The upper of the Venture 5 is made of a highly breathable mesh that wraps around the foot after lace-up for a snug, secure fit. Besides this, the outsole features numerous deep flex grooves that provide flexibility and help the runner maintain their natural stride. While a well-balanced and stable feeling shoe during a run, the GEL cushioning in the heel may make some runners feel a little off-balance at first. With a standard 10mm drop, this is comparable to most running shoes in terms of overall stability. It is not specifically a stability shoe. No surprises to be found on the Venture 5 as far as stability is concerned: a standard 10mm drop, which most neutral runners will find acceptable and comfortable. • Shock absorption mechanism due to Gel cushioning system. The Asics Gel Venture 5 is reflective of how far modern running shoes--particularly trail running shoes--have come in such a short time. Lightweight (for a trail shoe) without skimping on the protection and traction a runner depends upon while out on the trail, the Venture 5 also provides deluxe comfort at an affordable price. Asics has been putting out consistently stellar trail running shoes, and ones that don’t break the bank. The Venture 5 continues in this tradition: a trail runner that offers tenacious traction and made of high-quality, long-lasting materials, trail runners—especially those new to the pursuit and may be hesitant about investing in a top-dollar trail running shoe—may have a new go-to shoe in the Asics Gel Venture 5. At this price, who could argue with it?